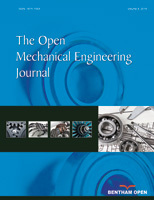 In this study, a double mode muffler that can automatically adjust the exhaust resistance according to the engine speed was designed. Based on computational fluid dynamics theory, the governing equation and turbulent equations for numerical simulation of muffler were established. The pressure loss and the internal flow characteristics of the double mode muffler were analyzed by CFD software. The influence of the distance between the main and submuffler on the flow field of exhaust system was researched. In addition, the internal pressure distribution, the turbulence intensity distribution and the velocity vector diagram of the dual mode muffler were also obtained. The pressure loss of double mode muffler is mainly distributed in the area of air mutations. Main silencer plays a leading role in the entire exhaust system. Therefore, the trend of the pressure loss of the exhaust system with the change in the distance between main and auxiliary muffler was also obtained. When the distance between the main and auxiliary silencer changed from 50 mm to 300 mm, the pressure loss of exhaust system muffler first increased and then decreased, and following this, continued to increase. The results will provide a theoretical basis for designing complex exhaust system.